How I got my babies to sleep through the night! Sleep and Babies in the same sentence stirs up a variety of emotions in every parent. Melea was born when Thalia was only 15 months old. Thalia herself was still a baby, and although I wasn’t breastfeeding her anymore – she still wanted to sleep close to me at night. I knew this was going to be an issue when our newborn arrives, but no tricks could get Thalia to sleep in her own bed. I was hospitalised for 3 weeks before Melea was born, so to top everything – Thalia’s separation anxiety skyrocketed… But still Murphy thought it would be funny for Thalia to get double Middle Ear Infection 2 days before Melea was born and for Melea to be blessed with severe Reflux and Colic. Honestly the first 3 months since Melea was born is a blurred memory… . Then I heard about the Lulla Doll. The Lulla Dolls arrived early morning, I immediately took them out and wrapped them to my body underneath my clothes so that they could absorb my smell. That night once both babies were asleep, I switched both Lulla’s on, and put Thalia and Melea down in their own beds with their own Lulla’s. Melea (3 months old) slept from 11pm that night till 7am the next morning, no clusterfeeding during the night to soothe her reflux and colic… Thalia slept from 8pm till 5am the next morning, when she called me for the first time that night. I was speechless – this was the best nights rest myself and hubby had in months! This was only the start, till today (10 months later) they both still sleep with their Lulla Dolls – in their own bed from 8pm till 6am every night. Lulla is designed to promote better, longer and safer sleep by imitating closeness to a caregiver at rest. Much care, thought and love has been put into every detail of the Lulla Doll. 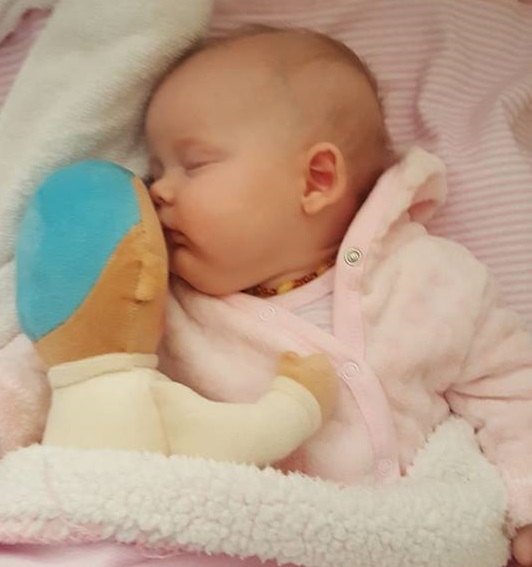 It took three years to develop and test the Doll with the help of doctors, nurses, midwifes, psychologist, engineers and numerous parents and baby testers during development. Lullas unique design is based on multiple scientific research that shows how closeness of a caregiver, and particularly to the sounds of heartbeat and breathing can improve sleep, well being and safety. The concept was first made with the needs of premature born babies in isolation in mind. Babies are not designed biologically or psychologically to sleep in complete social isolation in a sensory deprived context. The stabilizing and calming effect of closeness and in particular, the sounds of heartbeat and breathing has been studied for decades. Infants depend on proximity and contact with their caregivers. One main reason being the immaturity of their cardio-respiratory systems. Closeness promotes efficient functioning of all of the infant’s immature organs and the central nervous system in general according to McKenna, the leading expert in co-sleeping. We are meant to stay close to each other. In addition, there are multitude of studies stating that co-sleeping has a calming effect and stabilizes heartbeat and breathing patterns. For this reason, paediatric guidelines now recommend that babies sleep in the same room as parents for at least the first year as it is thought it can decrease the likelihood of SIDS by up to 50%. There have been other studies before suggesting that having small children sleeping alone could increase the risk of SIDS. The positive effects of Kangaroo care are well known, which is a skin to skin method used mostly on premature born babies as it has shown to help them thrive in terms of regulating temperature and breathing. The closeness to the caregivers chest being a key component. There have been studies showing that babies that were held at the left side of the body of the caregiver slept better, gained weight faster, did not cry as much and had more stable respiration patterns and heart rate. It is believed that the reason for this is that these children are closer to the heartbeat of the caregiver. Furthermore there have been significant long standing clinical studies on the effect of simulated breathing sounds on infants that has given hope for infants that are not able to be close to a caregiver. These were studies that provided premature infants a breathing bear (a specially developed bear with artificial breathing sounds) and showed positive effects on the sleep/wake states, respiration and affective behaviours. The infants who were given the breathing bear showed less wakefulness, more quiet sleep, fewer startles in quiet sleep and less crying than premature infants who were not given the bear. In addition, they were more likely to smile and non-breathing bear babies were more likely to grimace in active sleep. These findings replicate and extend previous reports of effects of the breathing sounds on neurobehavioral organization. They also suggest that less negative affect is expressed by the breathing bear” babies; and they point to the importance of future study of preterm infants’ affective expressions, both in sleep and in waking. More importantly, the babies breathing and heartbeat remained stable even after the breathing bear was removed. These results imply that the presence of breathing increases neural development and that breathing sound played for the children can have similar benefit as the actual presence of the caregiver. Lulla plays a real-life recording, up to 8 hours, of the breathing and heartbeat of a mother at rest. Her name is Gudrun. She is a mother of 4 and a kundalini yoga teacher. The soothing sounds were recorded when she went into a deep meditative state to relax her heartrate. The breathing used is called Ocean breathing or Ujjayi breathing, which is a breathing technique employed in a variety Taoist and Yoga practices. The sounds resemble ocean waves rolling and there are many benefits of using this kind of breathing, including having a balancing and calming effect. It has also been shown by research that by using a lovey such as a doll or comforter your baby is more likely to sleep through the night at an early age. Compared to babies without comforters, babies with comforters are more secure in times of change, stress or separation. Further research has even shown that loveys or comforters can be as effective as parents in settling baby in situations of moderate distress. Paediatricians recommended that the comforter is baby-safe, in pale colours and washable and that before giving the comforter to the baby to keep it close to the skin for a few hours or overnight so that it smells of you. Nothing can replace loving human contact but the Lulla doll aims to be a second best. Shop your own Lulla Doll here or send us an e-mail to enquiries@liaandreese.co.za for more information or tips and tricks about the Lulla Doll. 1. Lacey, Jennifer. Kangaroo care. Skin-to-skin contact to help your preemie. 2. Field, Tiffany. (2001). Touch. Massachusetts Institute of Technology, USA. 4. Sunderland, Margot (2006). The science of parenting. Penguin. 6. Thoman et al. (1995), The breathing bear with preterm infants: Effects on sleep, respiration, and affect. 7. Ingersoll & Thoman. (1994). The breathing bear: Effects on respiration in premature infants. 8. Mitchell, Lisa. (2012). 8 Reasons Why We Use Ujjayi Breath in Yoga. 9. Fizgerald, Lucy. (2010) How a lovey can help your baby sleep. Thank you so much for sharing your experience! Love how your post promotes Co sleeping, and that there as a second best alternative available for when needed! All the best to you and your Little One’s!